I was recently prepping for a Skype consultation that I was conducting with a curriculum team in the midst of exploring a strategic plan for improving their students’ current math achievement. One of several areas under exploration was the use of classroom walkthroughs to gain information concerning current teaching and learning experiences. 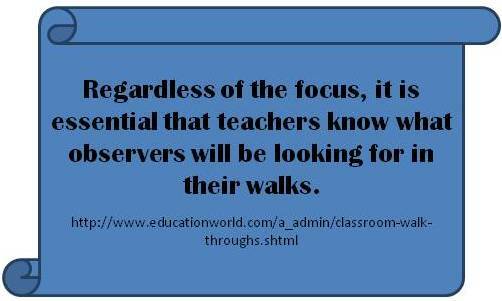 In a recent Education World blog tips for walkthroughs, taken from Classroom Walkthroughs to Improve Teaching and Learning, by Donald S. Kachur, Judith A. Stout and Claudia L. Edwards are shared. Quite often when I am consulting in schools with coaches and principals, I am asked to join them on some walkthroughs and handed their district walkthrough form. Frequently I find myself frustrated at the number of items being considered and the often need for the observer to make a “conclusion or judgement” from too little observational data. Teacher was asking higher order questions. Students were engaged in higher order problem-solving. My finding is that too little is observed in five minutes for it to be recorded as a conclusion. Therefore my suggestion to most school leaders is that the data from walkthroughs be used to raise questions for the administrator that lead to more in-depth observations or data collecting activities. “After looking at the data from this month’s walkthroughs, I recognize that there were very few times that we observed students engaged in collaborative problem-solving. I wonder “what opportunities students are getting?” Because of the question, the principal asks teachers to bring to the next faculty meeting a sample of collaborative problem solving they have used with students. At the meeting he asks teachers to invite him to observe an upcoming collaborative problem solving lesson. The principal now has information that can be used to give teachers feedback and to assess any need for change in teaching and learning. The above thoughts were present when I viewed the draft of the curriculum team’s walkthrough form for math classes. Teacher behaviors observed to encourage student use of vocabulary. Record some of the problems you observed students addressing. List strategies you observed students using. Identify numbers of students observed using the strategy. Persevering with a second or third strategy when first isn’t successful. #3 Students collaborate and participate in mathematical discussions with peers. Record some comments/questions you heard students sharing with each other. How much student voice occurred during the observed collaboration? My thinking is that teachers could be involved in the design of such a form. Agreement between teachers, curriculum staff, and principals around the desired learning behaviors would be team building. Teachers individually and in PLCs could use the data for coaching and planning. I believe the specificity of what was observed (questions, problems, student statements and questions) can lead to increased thinking and continuous improvement.